A horse drawn carriage may be thought to be the preferred choice for travelling to a wedding. It may be the traditional choice; it may create the romantic and relaxed sentiment of marriage. What about the exhilarating and exciting approach? Surely on this exciting day you don’t want to start this journey trotting along or arriving with the acceleration of a pony trek. No, you want to start as you mean to go on, with a weightless swiftness and the velocity of a galloping steed. How can you compare the traditional horse and carriage to the amazing ‘prancing horse’ of the Ferrari? This chauffeur driven Ferrari F430 spider is by far the most thrilling option, how could you ever choose any wedding transport over this stunning super car – with the power of not 1 but 483 horses there just is no comparison. 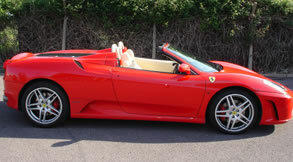 What is more appealing than a groom arriving in the superb style of a chauffeur driven Ferrari wedding day car? There is not a more exotic image than that amazing prancing horse dazzling on a bright red bonnet as the striking groom steps out to meet his beautiful bride to be. This famous supercar is nurtured from the fine breeding of the Maranello stables. With perfect suspension and the extensive use of carbon fibre, it keeps the weight down and performance up, making this car remarkably stylish and a pleasurable drive. This baby from the Ferrari legacy is most certainly a car that Enzo Ferrari would be proud of. This true thoroughbred is both eye-catching and better than any other supercar in its class. As we steer through the streets to your venue the Formula 1 technology will thrill and create the ultimate chauffeur driven experience for the groom to remember forever. The party will hear the highly tuned screaming of the v8 engine before they see you. As they anticipate the moment they will be astonished by the remarkable spectacle this F430 creates. Of course this car will arrive in the color to which nothing else compares, the vibrant Ferrari red. It will be chauffeured to professional perfection. We keep our stallion well groomed and in pristine condition so it will be perfect for your special day. Your guests will be in complete awe of you as no other super car is as evocative or exhilarating as a Ferrari. To book your impressive ‘prancing horse’ Ferrari for your chauffeur driven wedding day car, just contact us at special day cars and we will put together a tailor made package to suit your day.